Chairman, American Freedom Alliance; President, Westside Republican Club of Los Angeles; Treasurer, Republican Party of Los Angeles County; Vice President, Westchester-Del Rey Republican Club; Founder, San Fernando Valley Republican Club; President, Westside Realty Advisors, Inc.
How did our nation go from having a high-growth economy in the 19th and early 20th centuries, to struggling in recent years to achieve 3 percent annual growth? The American economy today is mixed: It is partly free, vibrant, prosperous, and entrepreneurial and partly unfree, obstructed, and lethargic. The wisdom on Wall Street is that Hillary Clinton is the safe choice. She’s the certainty candidate to Trump’s uncertainty. So when Jim Comey announced the reopening of the FBI’s Clinton investigation, stocks fell for nine days. And after he pulled back over the weekend, stocks rallied for over 300 points. Is the market correct in viewing Hillary as the safe and certain choice? I don’t believe so. Stimulus will not help your performance issues. The Economic Stimulus Plan proposed by the Administration is a pork-laden bill and will not stimulate the economy. 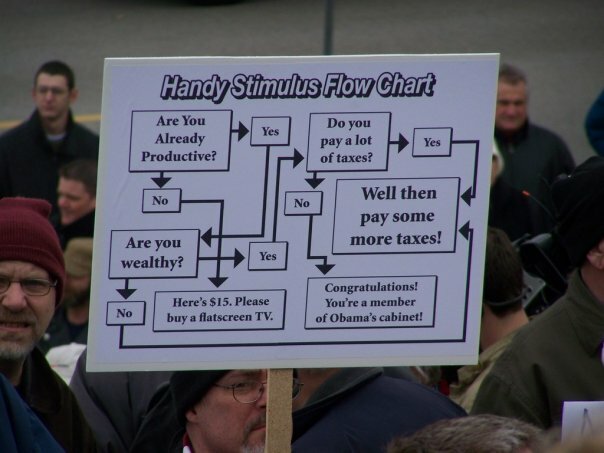 You can’t stimulate the economy by increasing our national debt or by printing more money. If you would like to be involved in action to stop the passage of this bill that would not do anything to help the economy, go to TCOT ACTION PROJECTS and register. Then go to the action group: Operation “MOVE OVER MoveON.” You will find a plan of action as to how you can help. Who is Responsible for the Financial Meltdown? Barack Obama likes to lay the cause of the current financial meltdown at the feet of the current administration. The facts are very different. Obama in a statement yesterday blamed the shocking new round of subprime-related bankruptcies on the free-market system, and specifically the “trickle-down” economics of the Bush administration, which he tried to gig opponent John McCain for wanting to extend. But it was the Clinton administration, obsessed with multiculturalism, that dictated where mortgage lenders could lend, and originally helped create the market for the high-risk subprime loans now infecting like a retrovirus the balance sheets of many of Wall Street’s most revered institutions. Tough new regulations forced lenders into high-risk areas where they had no choice but to lower lending standards to make the loans that sound business practices had previously guarded against making. It was either that or face stiff government penalties. Yes, the market was fueled by greed and overleveraging in the secondary market for subprimes, vis-a-vis mortgaged-backed securities traded on Wall Street. But the seed was planted in the ’90s by Clinton and his social engineers. They were the political catalyst behind this slow-motion financial train wreck. And it was the Clinton administration that mismanaged the quasi-governmental agencies that over the decades have come to manage the real estate market in America. As soon as Clinton crony Franklin Delano Raines took the helm in 1999 at Fannie Mae, for example, he used it as his personal piggy bank, looting it for a total of almost $100 million in compensation by the time he left in early 2005 under an ethical cloud. Other Clinton cronies, including Janet Reno aide Jamie Gorelick, padded their pockets to the tune of another $75 million. Raines was accused of overstating earnings and shifting losses so he and other senior executives could earn big bonuses. In the end, Fannie had to pay a record $400 million civil fine for SEC and other violations, while also agreeing as part of a settlement to make changes in its accounting procedures and ways of managing risk. But it was too little, too late. Raines had reportedly steered Fannie Mae business to subprime giant Countrywide Financial, which was saved from bankruptcy by Bank of America. At the same time, the Clinton administration was pushing Fannie and her brother Freddie Mac to buy more mortgages from low-income households. The Clinton-era corruption, combined with unprecedented catering to affordable-housing lobbyists, resulted in today’s nationalization of both Fannie and Freddie, a move that is expected to cost taxpayers tens of billions of dollars. Fannie and Freddie went broke because they had bought billions of dollars worth of subprime mortgages, on which borrowers defaulted when the housing bubble popped. Fannie bought most of its bad mortgages from Countrywide Financial, whose CEO, Angelo Mozilo, gave sweetheart loans to senior executives of Fannie Mae. Fannie and Freddie cooked their books so senior executives would be paid millions of dollars in bonuses to which they were not entitled. Inadequate regulation kept the book-cooking from being discovered until the crisis had become a catastrophe. President Bush proposed regulatory reforms in 2003, but Congress took no action. In 2005, John McCain and three other GOP senators proposed a strong reform bill. It died when Democrats threatened a filibuster. When the bill was reintroduced in this Congress, Sen. Chris Dodd, the new Democratic chairman of Banking Committee, refused even to hold a hearing on it. Democrats opposed reform in part because they feared it would mean fewer loans to poor people. Democrats and some Republicans opposed reform because Fannie and Freddie were very good at greasing palms. Fannie spent $170 million on lobbying since 1998, and $19.3 million on political contributions since 1990. The principal recipient of Fannie Mae’s largesse was Sen. Dodd. Number two was Barack Hussein Obama. Sen. Dodd was also the second largest recipient in the Senate of contributions from Countrywide’s PAC and its employees. The number one senator on Countrywide’s list? Sen. Obama appointed Mr. Raines’ predecessor, James Johnson, as head of his vice presidential search committee, until he was also implicated in “accounting irregularities,” and it was revealed he’d received cut rate loans from Countrywide. Chicago billionaire Penny Pritzker, chairman of Sen. Obama’s finance committee, cooked the books to conceal losses from subprime mortgages at her now defunct Superior bank. The holding company her family owned collected $200 million in dividends on phony profits. The trouble with crony capitalism isn’t capitalism. It’s the cronies. This meltdown can be laid directly at the feet of Democrats. Barack Obama, Bill Clinton and other Democrat cronies are responsible. It will be interesting to see how Obama spins his way out of this one. There are certainly plenty of places to point fingers, and it may be hard to pinpoint the original event that set it all in motion. But let me give you an educated guess. The financial crisis we’re living through today started with the corruption and manipulation of our home mortgage system. At the center of the problem were the lobbyists, politicians, and bureaucrats who succeeded in persuading Congress and the administration to ignore the festering problems at Fannie Mae and Freddie Mac. These quasi-public corporations lead our housing system down a path where quick profit was placed before sound finance. They institutionalized a system that rewarded forcing mortgages on people who couldn’t afford them, while turning around and selling those bad mortgages to the banks that are now going bankrupt. Using money and influence, they prevented reforms that would have curbed their power and limited their ability to damage our economy. And now, as ever, the American taxpayers are left to pay the price for Washington’s failure. Two years ago, I called for reform of this corruption at Fannie Mae and Freddie Mac. Congress did nothing. The Administration did nothing. Senator Obama did nothing, and actually profited from this system of abuse and scandal. While Fannie and Freddie were working to keep Congress away from their house of cards, Senator Obama was taking their money. He got more, in fact, than any other member of Congress, except for the Democratic chairmen of the committee that oversees them. And while Fannie Mae was betraying the public trust, somehow its former CEO had managed to gain my opponent’s trust to the point that Senator Obama actually put him in charge of his vice presidential search. This CEO, Mr. Johnson, walked off with tens of millions of dollars in salary and bonuses for services rendered to Fannie Mae, even after authorities discovered accounting improprieties that padded his compensation. Another CEO for Fannie Mae, Mr. Raines, has been advising Senator Obama on housing policy. This even after Fannie Mae was found to have committed quote “extensive financial fraud” under his leadership. Like Mr. Johnson, Mr. Raines walked away with tens of millions of dollars. Senator Obama may be taking their advice and he may be taking their money, but in a McCain-Palin administration, there will be no seat for these people at the policy-making table. They won’t even get past the front gate at the White House. My friends, this is the problem with Washington. People like Senator Obama have been too busy gaming the system and haven’t ever done a thing to actually challenge the system. We’ve heard a lot of words from Senator Obama over the course of this campaign. But maybe just this once he could spare us the lectures, and admit to his own poor judgment in contributing to these problems. The crisis on Wall Street started in the Washington culture of lobbying and influence peddling, and he was square in the middle of it. For those who want to attribute any blame to the Bush administration for this meltdown, you should be aware that this administration tried, on 17 different occasions in 2008 alone, and many more times than that over the past seven years, to attempt to insert some oversight or limits to the growth of Fannie Mae and Freddie Mac, and the whole sub-prime mortgage business and on each occasion the administration’s proposed legislation was blocked by the Democrats in Congress. For details go here.